The other side of happy hour! First off let me say sorry for being away so long! I’ve been hitting the gym hard as well as sampling the cuisine and nightlife. The rare occasion happened when me and a coworker both had the day off. We ended up at Lindey’s in the historic German Village in Columbus, OH. 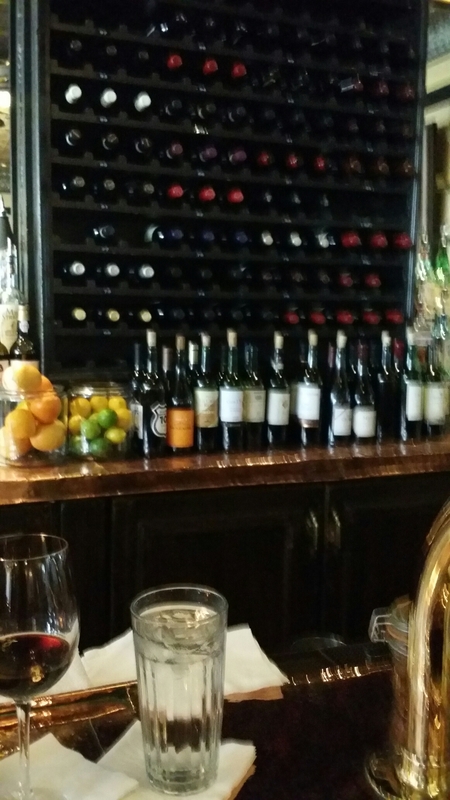 Although established in 1981 Lindey’s feels like you stepped into a 1950s upscale restaurant. Everything shines, leather seats, and the bartenders wear long sleeves and tucked in ties. 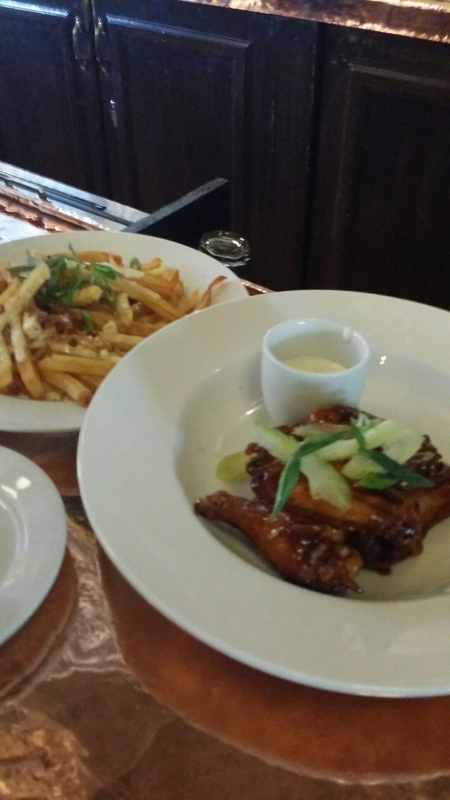 Our sampling began with honey sriracha wings and truffle fries. This was my first time having truffle oil fries and although pleasing they were overshadowed by the wings. Under the sticky sweet glaze that didn’t drip off was the amazing crisp skin. The thing about these wings is they didn’t get soggy as they cooled! For dinner I ordered Tempranillo red wine and beef carpaccio. 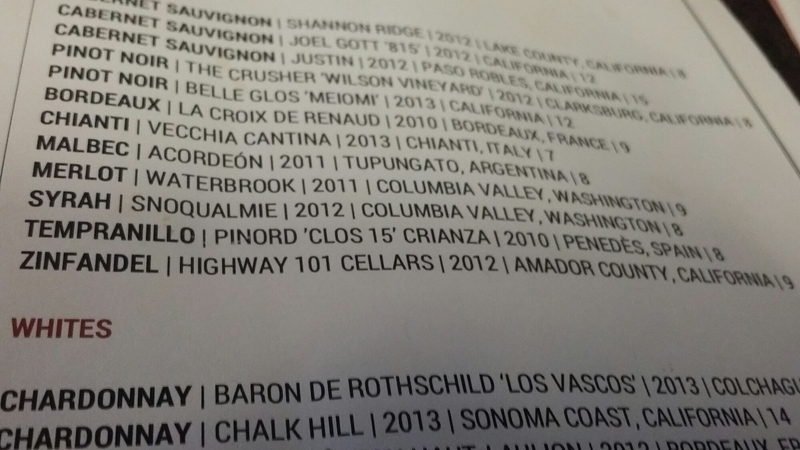 My wine choice was based solely on the fact that I never seen Tempranillo on any other wine list in the area. Tempranillo is the dimunitive of the Spanish Temprano (“early”), a reference to the fact that it ripens earlier than other Spanish grapes. 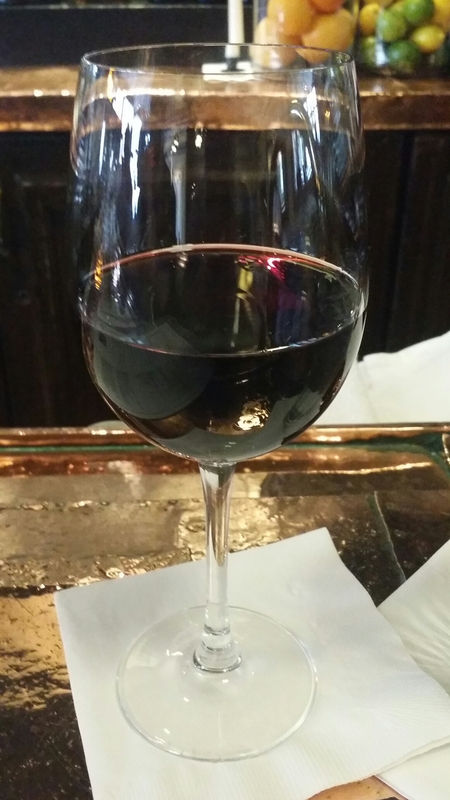 Tempranillo has low acidity and sugars so is often blended with merlot or cabernet to liven the flavor profile. The aromas and flavors can include plum, berries, tobacco, leather, and vanilla. I definitely get a berry aroma followed by a plum like flavor. 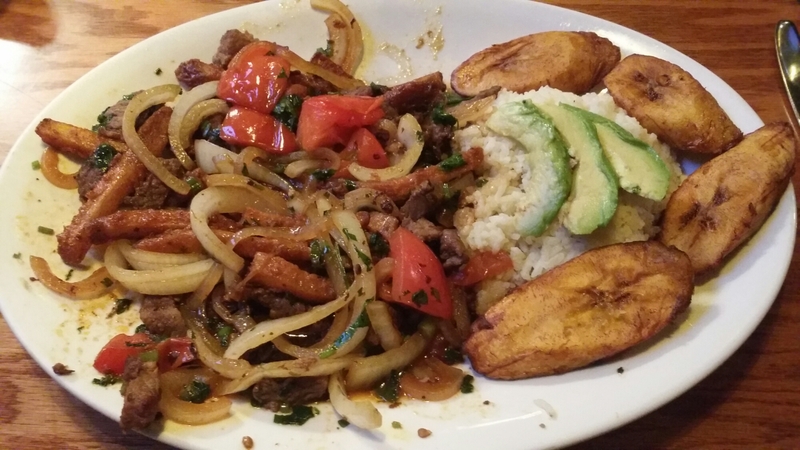 Most people know I rarely eat beef but I have heard so much of this dish it’s been on my list for awhile now! 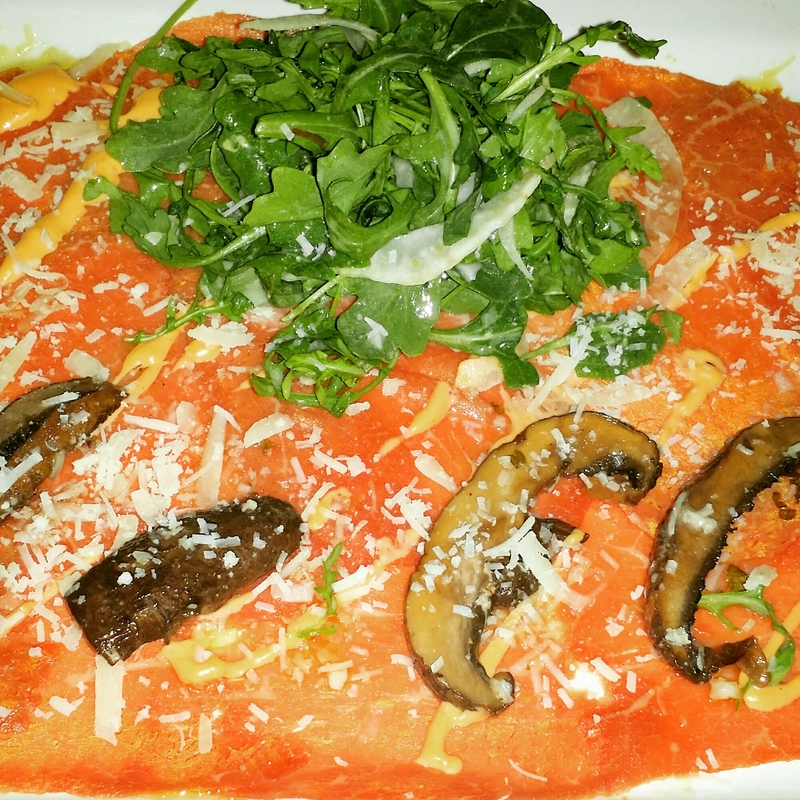 The Italian version of sushi, beef Carpaccio, is thinly sliced beef marinated in olive oil, lemon, salt and pepper, topped with mushrooms, parmesan, and spicy arugula. So simple but so satisfying! Do like I did and take advantage of happy hour at various places to sample the atmosphere and goods for cheap and save money for dates and business dinners . 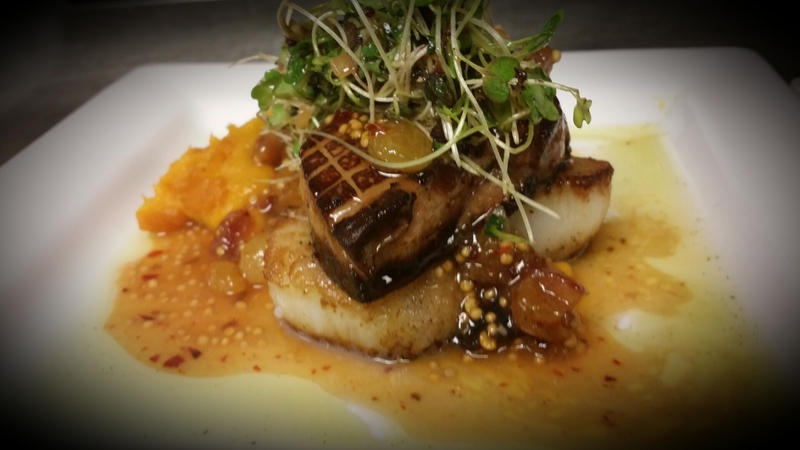 Then when your ready for date night you are familiar with all the restaurants in the area. This is just one of many mantras I heard from my wonderful mother growing up. I love trying new things anyway but sometimes I need a little extra push! When I’m craving crisp grapes, sweet cherries, juicy pineapple, or the always versatile banana I must remember there’s more to this world! This trip to the market I bring back Spanish limes and longan fruit. Native to the Caribbean, Spanish limes go by many names. Mamoncillo, quenepas, genip, and limoncillo are the most common. This small round citrus fruit is about the size of an olive with a thin hard shell. Inside the shell is a large seed with a pulpy sweet membrane surrounding. The flesh is orange to salmon in color. 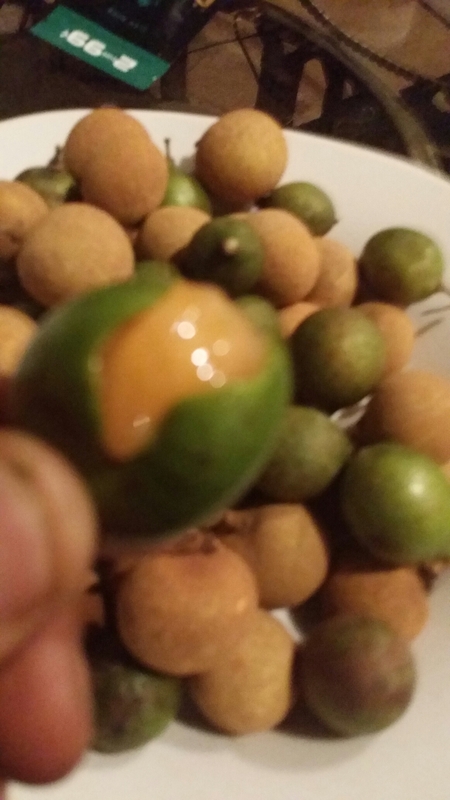 Since the seed takes most of the mass of a Spanish lime they are sucked until the pulp is gone. The fruit can be sweet or sour. Despite the name the taste is not like lime to me and more like a tangerine or the Tang drink mix. It’s common to enjoy these fruits with a sprinkle of chili powder, salt, and lime juice. The seeds can be roasted and salted for a snack. Spanish limes have great citrus flavor and help curb appetite but I think a little too much work to prepare any dishes from it. 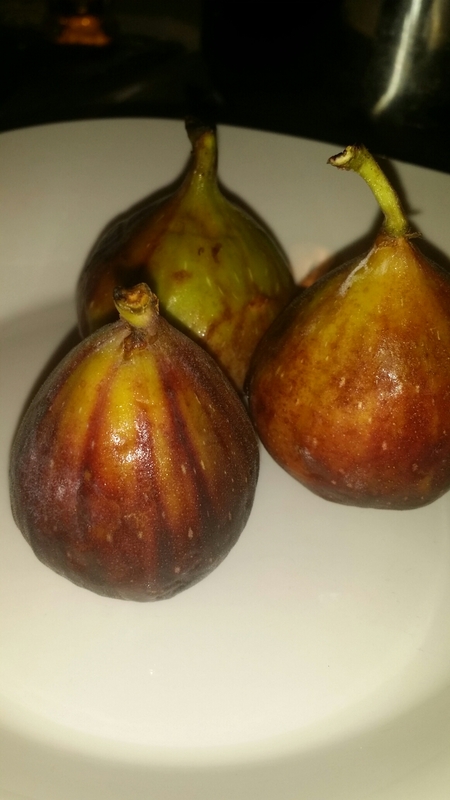 Be careful eating these despite the light color of the fruit it stains a dark brown. 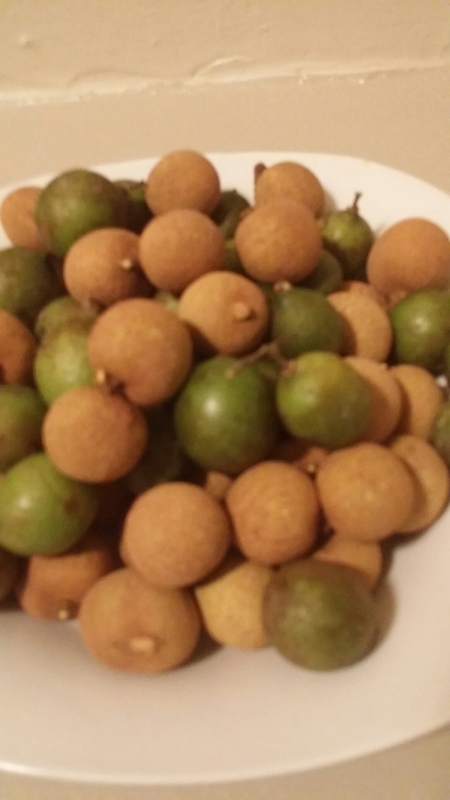 Longan fruit or dragon’s eye fruit is native to southern China and I’m surprised to actually find them fresh and not canned or dried. Nicknamed the dragons eye for the translucent flesh and dark seed with white spot resembling an iris. 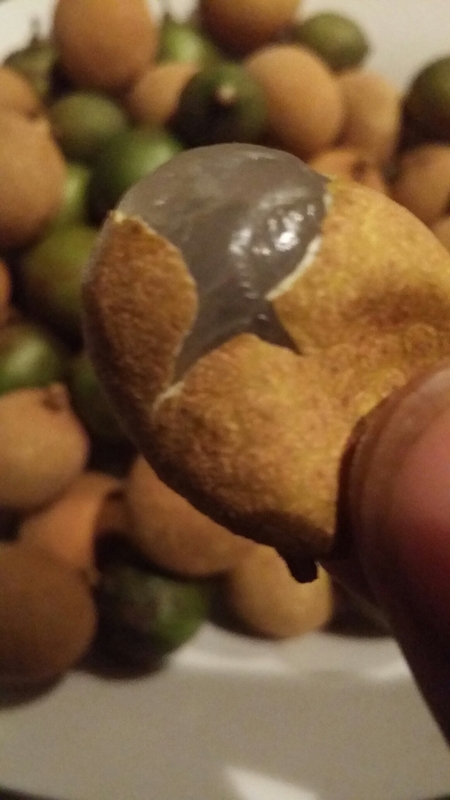 The longan shell is reddish brown and thin with a smooth bark like skin. The fruit is shelled by squeezing like a sunflower. Each 100-gram serving contains just 60 calories but with 3 ounces of water, so they help you keep thin and hydrated throughout the day . The longan has a crisp, juicy texture like a firm ripe white grape but a mild sweetness something like a cantaloupe. Traditional Chinese medicine holds that longan fruit is a great aphrodisiac, relaxant, and skin tonic as well. The fruit is high in iron making it great for blood production. They give a relaxing effect to the nerves and are shown to enhance the nerve function, lower irritability and reduce fatigue. The benefits are a plus but you can eat these like crazy just because too! Definitely a new favorite of mine, I encourage you all to give the longan a taste test whenever you come across these little market gems! This is a simple dish with tons of flavor and very little prep that is a perfect snack anytime of day. I like to make a plate and keep it in the fridge for snack time. 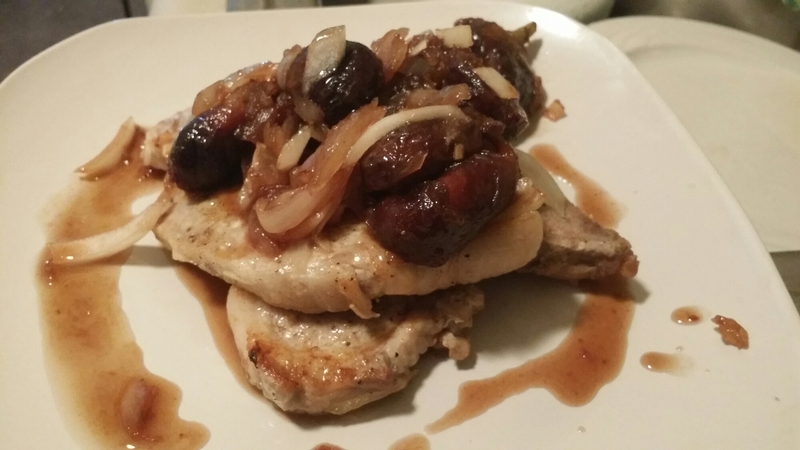 The biggest thing to watch here is eating too much as this dish is full of fat! Definitely not what you want to be snacking on if you have any sort of fitness goals! 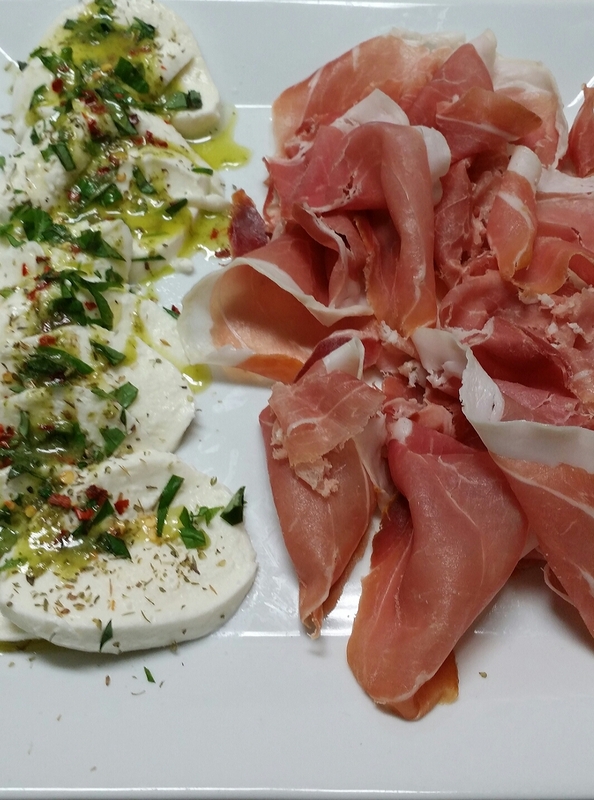 Prosciutto is an Italian dry cured ham commonly thinly sliced and served uncooked. It’s a great topping for pizza and bruschetta or wrap for thin cuts of meat or seafood. 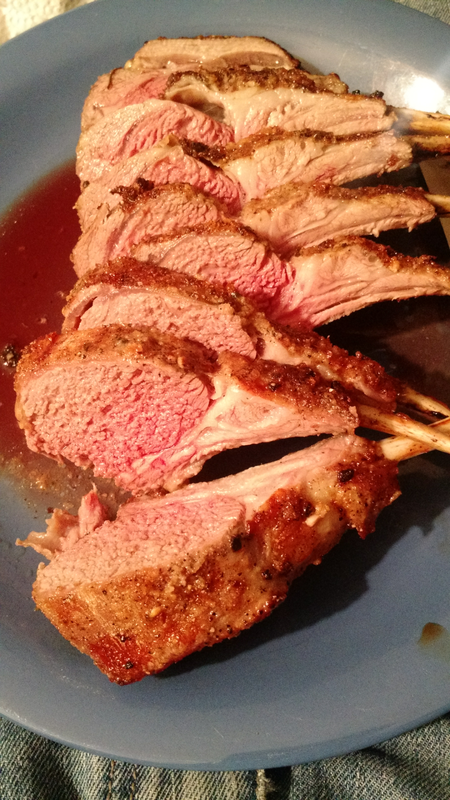 Salty but sweet with a light mouthfeel combine to make this meat irresistible and downright addictive!